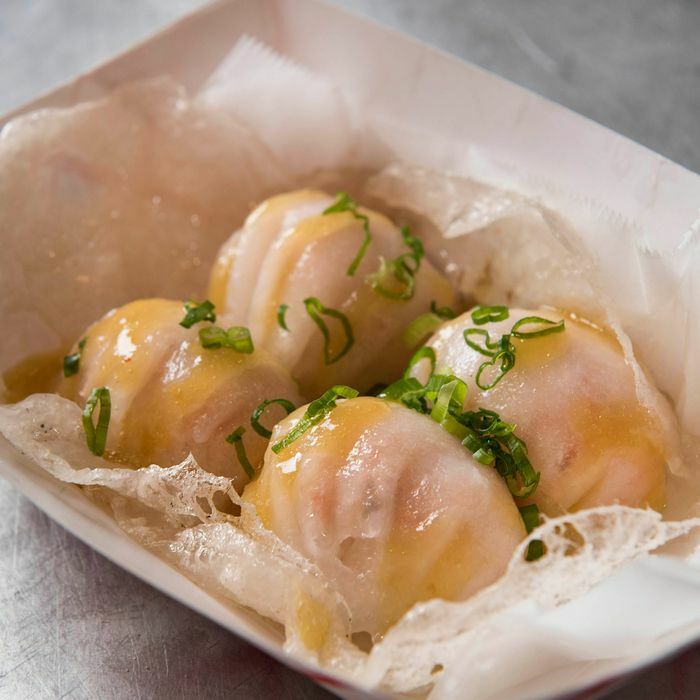 Making the dumpling right is a challenge: “It’s not just a simply wrapped dumpling. It has to be as translucent as possible, it’s a very funny skin where it’s both skinny and slick, so it’s tough to work with,” the chef points out. Cheung first experimented with the filling. After trying different seasonings and grinding methods, he ended up keeping it traditional: ground then chopped, with the usual bamboo shoots plus ginger. “We stuck to the discipline of it,” he says. East Wind is tiny, and has only one steamer, which posed a logistical challenge. 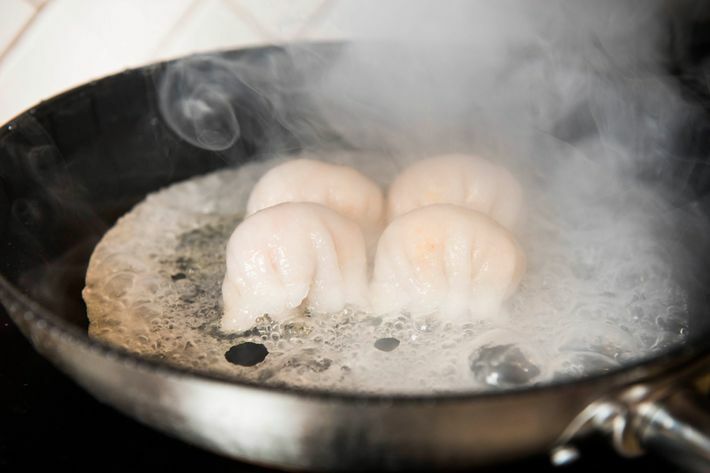 This prompted Cheung to try pan-frying the har gow before steaming, a double-cooking method like Shanghainese sheng jian bao. 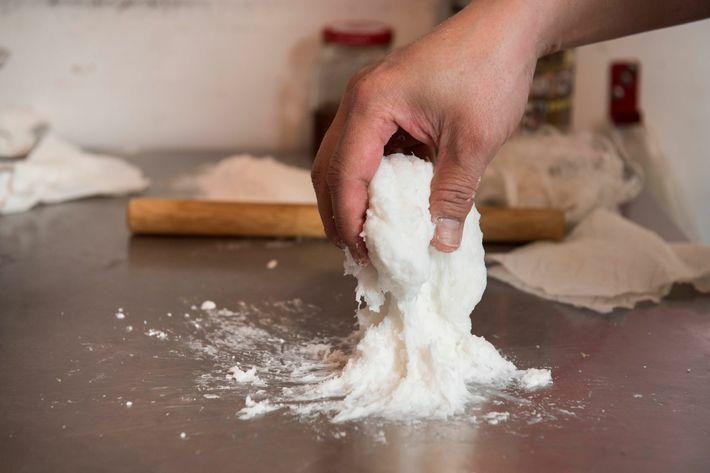 “That dough has shown itself in other forms in dim sum houses where they have fried it or pan-fried it, but not har gow,” he says. Cheung toyed with the frying to get the latticelike crust. (“It’s very easy to get that with cheese,” but he says, “I would never do that — add something foreign like that — to this.”) After finding that tapioca produced a “really nice, thin, lacy crust,” he had a happy kitchen accident when he added too much batter one day. “It had a nice crispy crunch, but also that gooeyness,” he says. The final touch is some Lee Kum Kee abalone sauce, playfully zigzagged over the dumplings. 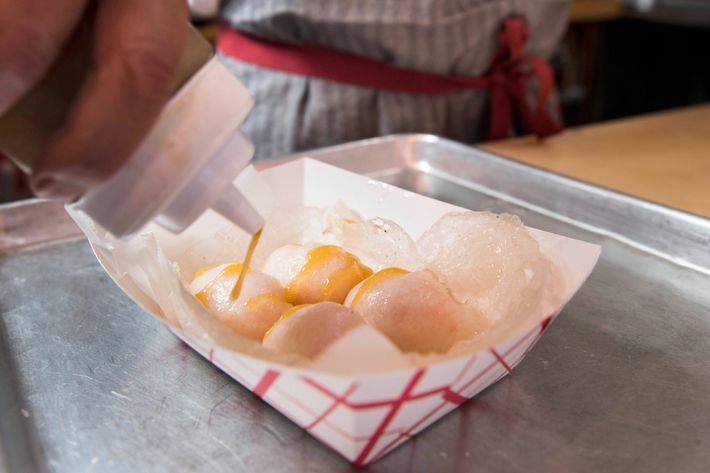 Har gow usually go “straight from the steamer to the mouth,” Cheung says, so adding a dressing was another “weird moment.” But the flavor felt right, and its taste reminds him of the dried seafood snacks he ate as a kid in Chinatown. 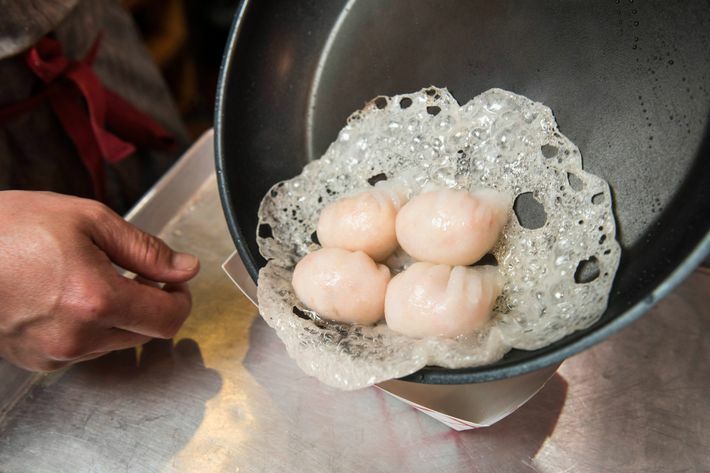 When you get your dumplings, you’ll see why Cheung doesn’t view them as anything but har gow. The ginger and sauce provide a boost of flavor, but the pure shrimp flavor isn’t lost. The skin is soft and slightly chewy, wrapped so tightly around the shrimp that they’re practically one. And that crust? It’s as gooey and crunchy as advertised, with the pleasing bounciness found in some yucca fritters. It’ll make you wonder why nobody thought to add it before.